The reasons why your opener is suddenly acting up or failing to work at all can be quite varied, and they won't always be obvious from the get go. Luckily for you, our professional technicians are here to help you with any type of problem your motor unit may experience. Your opener relies on the proper functioning of many different parts, all of which can wear out or break down after a while. The trolley carriage can detach from the door and render the device all but useless. The motor gear can wear out or break and thus make it impossible for the unit to produce any horsepower. Even the drive system, whether it's a chain, a belt or a screw, can break or tear. Whatever the case may be, you can rest assured that our team will be able to help by either repairing the problematic part or replacing it completely. If your door starts to reverse every time you try to close it, or if it seems to behave erratically and you can't tell why, there may be something wrong with either the opener's circuit board or its safety sensors. The electrical wiring may also be frayed or ruined, and will need to be replaced by a professional so that the problem could be resolved. Misaligned photo eye sensors are the no.1 cause of a reversing door, and if your motor unit seems to have a mind of its own, perhaps it's "mind", a.k.a the circuit board, is in fact malfunctioning. As part of our garage door maintenance service, we test the functionality of the unit's safety mechanisms and the condition of its electrical and mechanical components, in order to help our customers avoid as many problems as possible. 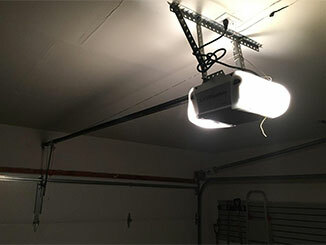 Our experts at Garage Door Repair McKinney are ready to help you with any related need you may have. Whether it's our opener installation services you're after or some urgent assistance, all you need to do is call us or use our online system to schedule an appointment.